Think of Downtown Dallas and several things will probably spring straight to mind. The historic moments marking DT Dallas’s past with sadness. The glitz and glamor associated with the city from its oil industry dollars and the eighties Dallas themed TV show. The famous football team and their equally famous group of cheerleaders. Has Downtown Dallas got anything more to offer than heartbreaking memories and girls in short skirts waving pom-poms? It certainly has. Downtown Dallas is the heart of Dallas both geographically and culturally. Within the boundaries of the one and a half square miles it covers, it has the biggest art district in North America and more museums than you can count on two hands. Not to mention some very unusual pieces of public artwork which are all must-sees. At night, Downtown Dallas lights up almost as bright as Las Vegas but has a much classier entertainment scene. Top-notch restaurants, stylish bars, and sophisticated nightclubs will keep you up until dawn. 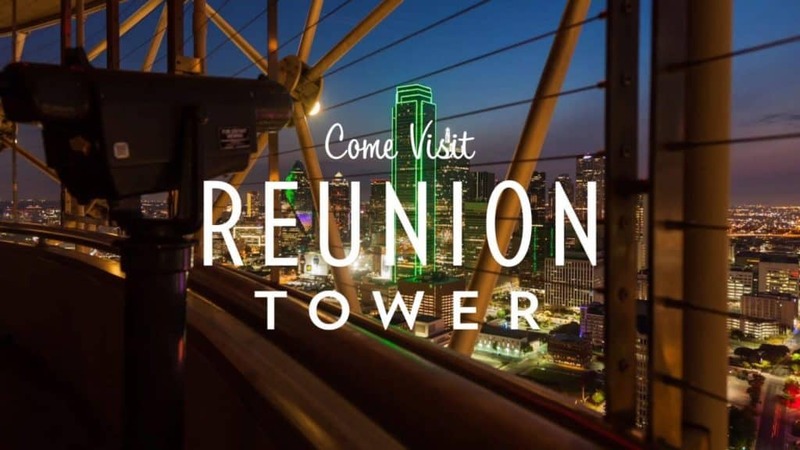 Don’t write a wish list, just put all of these fifteen best things to do in Downtown Dallas on your – I am so going to do that list – and you’ll have the time of your life downtown in the Big D.
The Reunion Tower on Reunion Boulevard dominates the Downtown Dallas skyline like an oversized Golden Globe Award. The striking tower, topped with an aluminum strutted globe, at just over five hundred and sixty feet high, is Dallas fifteenth tallest structure. The tower, which is part of the Hyatt Regency Hotel, has a three hundred and sixty-degree observation deck. Go up by day to see all of Downtown and then return at night on the same ticket, to see the DT Dallas nighttime illuminations. They’re incredible. The tower also has a revolving restaurant, the Five Sixty, which is a staggering fifty floors up with a stationary, glassed wall bar at its center. Try not to get dizzy on the views while you’re eating. Discover Downtown Dallas’s secrets while being driven around in an Efrog. What’s an Efrog? An Efrog is a funky, ecological, elongated, four-wheeled chauffeur-driven electric vehicle. Think brightly painted, economy-sized stretch limousine with zero emissions and you’ll be on the right track. Yes, it’s the fun way to tour Downtown Dallas or to hitch a ride from one bar to another. Take a one hour tour around DT’s most popular sights, a tour based on the history of JFK or go all out and have a four-hour brewery tour with drinks included. Tours carry a charge, but the shuttle service doesn’t. The driver works for tips only so don’t forget to be generous in both cases. They deserve it. One of the monumental moments in Downtown Dallas history occurred in Dealey Plaza in 1963. 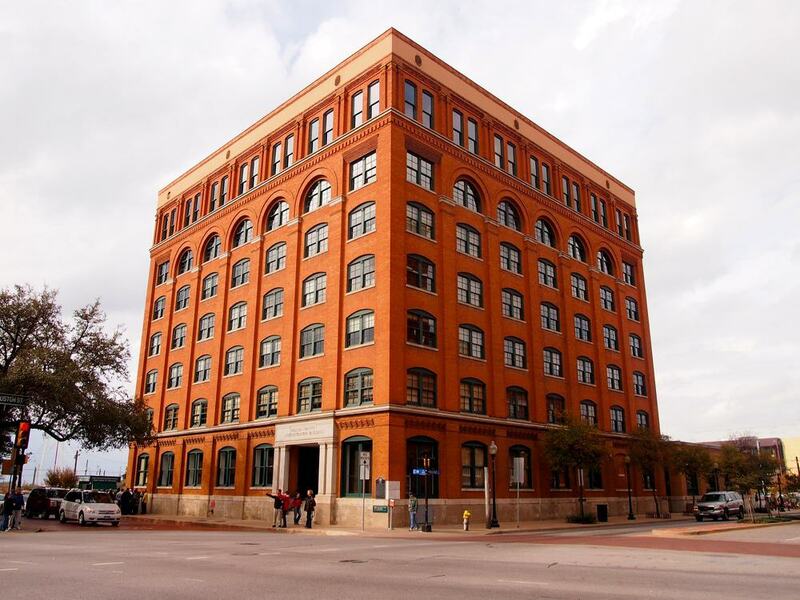 The 6th Floor Museum at Dealey Plaza is housed in the location used by the sniper to assassinate the then president of the United States, JF Kennedy. The museum, in the Dallas County Administration Building on Elm Street, exhibits original newsreel footage, a replica of the crime scene recreated from police photographs and other related artifacts. There is extensive information about JFK, his life, political influence, and the massive impact his death caused on the world at that time. 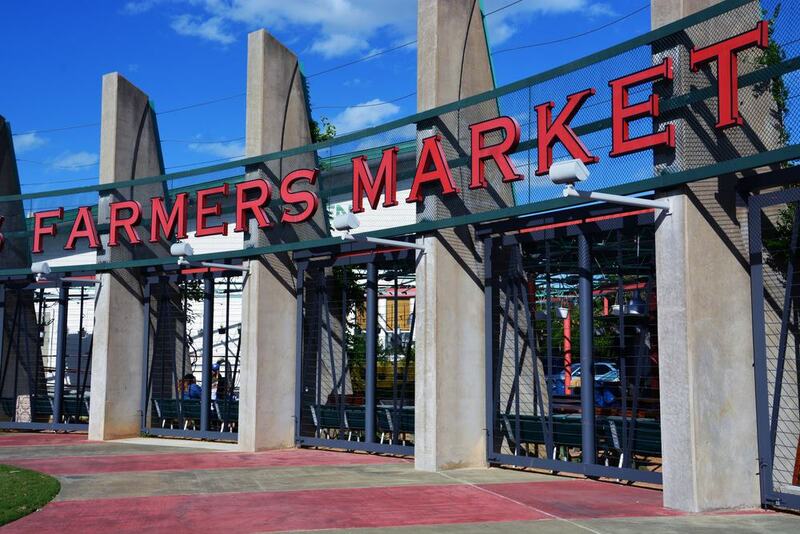 Operating since the early 1940’s, the Dallas Farmers Market on Harwood Street is a Downtown Dallas institution and open seven days a week. The main building, The Market, covers twenty-six thousand square feet of space with vendors selling everything from spices to seafood to household goods. There are four main restaurants and lots of pop-ups too. If you like to know the name of the hen which laid the eggs you’re buying or what flowers the bees who made the honey fed on, then head to The Shed. There you can purchase products directly from the grower, baker, rancher or confectioner from Friday through to Sunday. 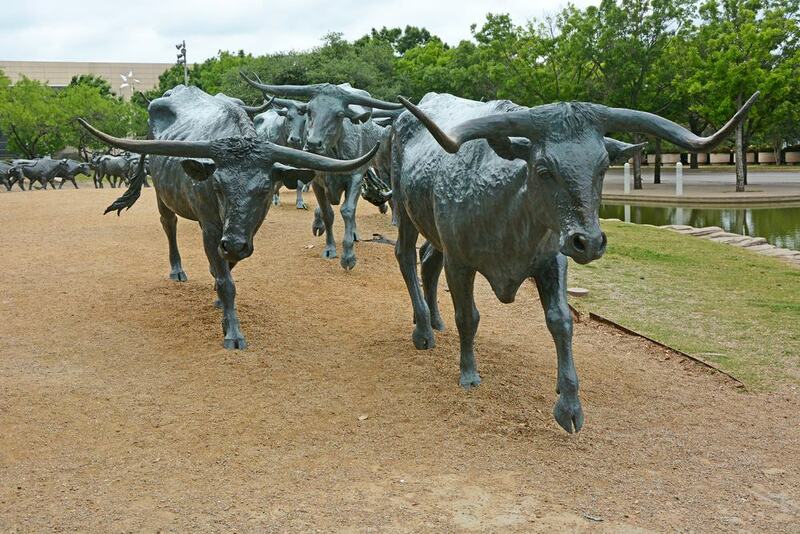 Make a visit to Pioneer Plaza in Downtown Dallas and take a step into a surreal wild west world. Although the bodies there are bronze and were never living, it’s not unlike walking among the petrified figures of Pompeii. The immense, fifty-two piece sculpture in the plaza is unique and the largest sculpture of its kind in the world. The three cowboys mounted on horses and herding forty-nine, larger than life steers through an artificial landscape of cliffs with a functional stream and waterfall is breath-taking. The Dakota’s Restaurant may be underground, but it’s definitely not a secret. 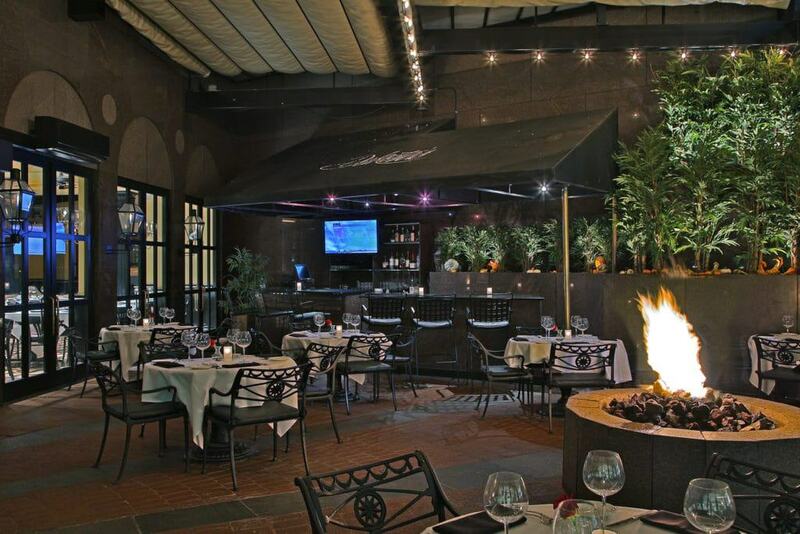 The steakhouse has been serving the Downtown Dallas community from the premises on North Akard Street for over thirty years. Ride down from street level in the glass elevator and enter into the stunningly decorated dining room complete with blazing fire pit and tiered water wall. They’re the perfect surroundings in which to enjoy a forty-five day aged Cowboy ribeye or Kansas City strip. They serve up some great seafood too. 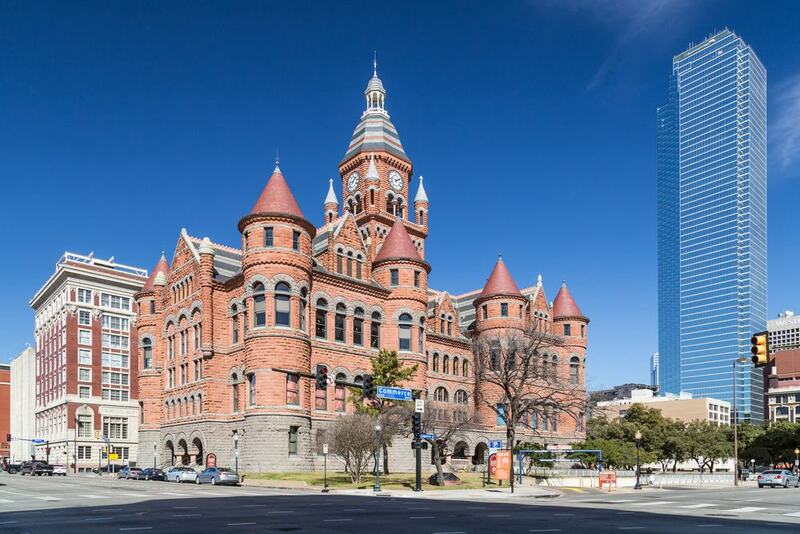 The Old Red Museum is an impressive, Disney fairytale castle-style, multi-turreted red brick building on Houston Street in Downtown Dallas. Originally constructed to serve as the Dallas County Courthouse, the museum showcases the history and culture of Dallas through the ages. The museum’s exhibits are diverse and included fossils, bicycles, banjos, and the county’s first traffic lights plus the handcuffs used to arrest JF Kennedy’s assassin. 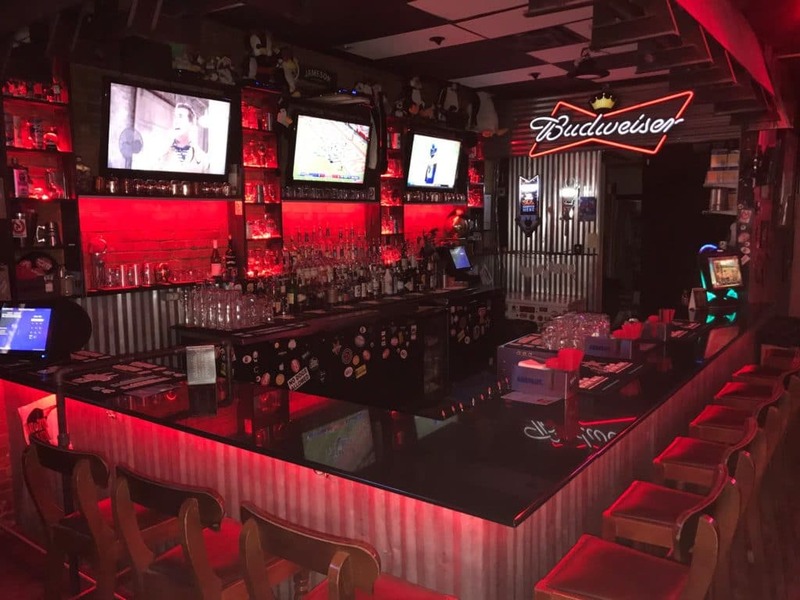 Drop in at the One Eyed Penguin on Downtown Dallas’s Main Street, and you’ll find everything you need for a great night out under one roof. Have a beer, shoot some pool or play a round of golf on the Golden Tee Live. The One Eyed Penguin is DT’s favorite dive bar and as well as serving a wide array of beverages, amid the nineteen nineties décor, the bar hosts event nights with stand-up comics and DJ’s and never fails to broadcast the Dallas Cowboys NFL games every Sunday on their eight mega-sized televisions. Wear comfortable shoes if you’re planning a stroll around the Downtown Dallas Art District. The installations comprising the district cover over sixty-eight acres. That’s a lot of ground to cover. The Art District’s thirteen main facilities include a five-acre park, a performing arts center, and hall, a symphony center, opera house, sculpture center, and two art galleries. 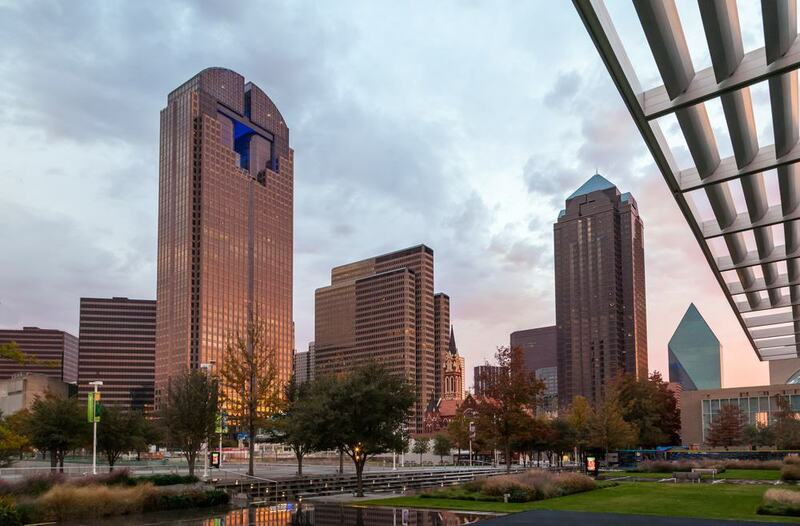 Within the district, there is also a Roman Catholic cathedral and Dallas’s sixth tallest building, the fifty-story high, Trammell Crow Center. 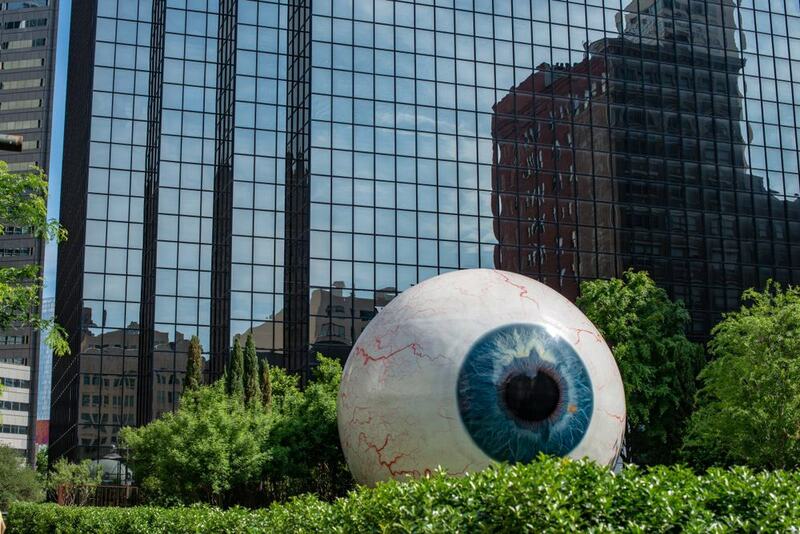 Shock your friends and Instagram followers by posting a photo of Downtown Dallas’s Giant Eyeball. Easily classified as Dallas’s weirdest piece of artwork, the giant eye sits on the grounds of the Joule Hotel on Main Street. Created by a Chicago-based sculptor, the blue-irised eye catches everyone’s attention which is understandable as its thirty-feet high and more bloodshot than any DT Dallas partygoers after a night on the town. It’s fun, it’s freaky and definitely different. Hop on a big red Trolley in Downtown Dallas at Dealey Plaza or any other of the fourteen trolley stops in downtown and hop back off when you feel like it. The trolleys operate every day, from ten o’clock in the morning until just after four in the afternoon, and pass all the major Downtown Dallas sights at regular thirty-minute intervals. Stay onboard to catch the full tour narration which takes an hour and twenty minutes then hop-off for visits on the trolley’s next circuit around. 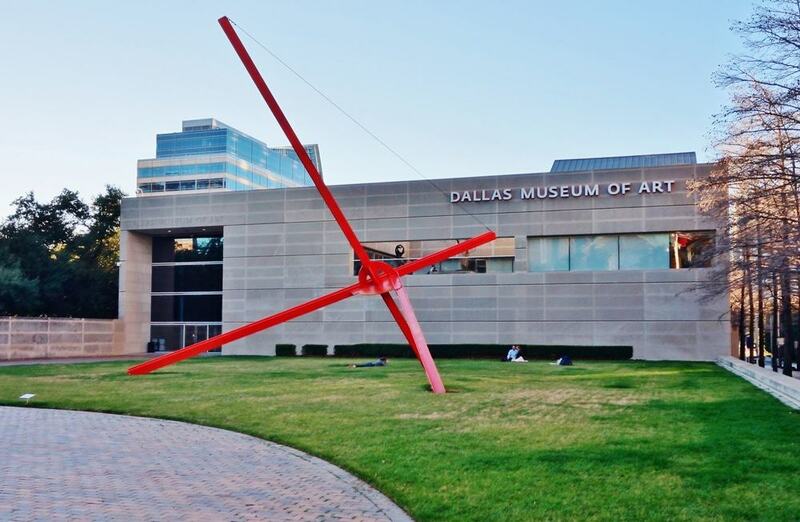 The Dallas Museum of Art is on North Harwood Street in the Downtown Dallas Art District. With almost one hundred and sixty thousand square feet encompassing galleries, exhibition spaces, a sculpture garden, and a library, the museum is one of the biggest in the States. The museum has a collection of over twenty-four thousand pieces in all the genres and from all over the globe. The most exciting being works from the sculptor Rodin and the artists Van Gogh, Monet, Gauguin, and Cézanne. There are regular monthly late opening nights when the museum doesn’t close its doors until midnight, weekly presentations from writers, artists, and musicians plus live jazz sessions every Thursday. Downtown Dallas may be a modern metropolis, but its history is long enough to have produced several haunted buildings which are, strangely enough, pubs. Meet your connection to the spirit world at the Green Door Pub on Harwood Street. They’ll get you in the mood for the night by regaling you with a few spooky tales accompanied by a drink or two before heading off for more spooks and spirits at another three or four reputedly haunted bars. The fun and sometimes spine-tingling tours last for around two and a half to three hours. 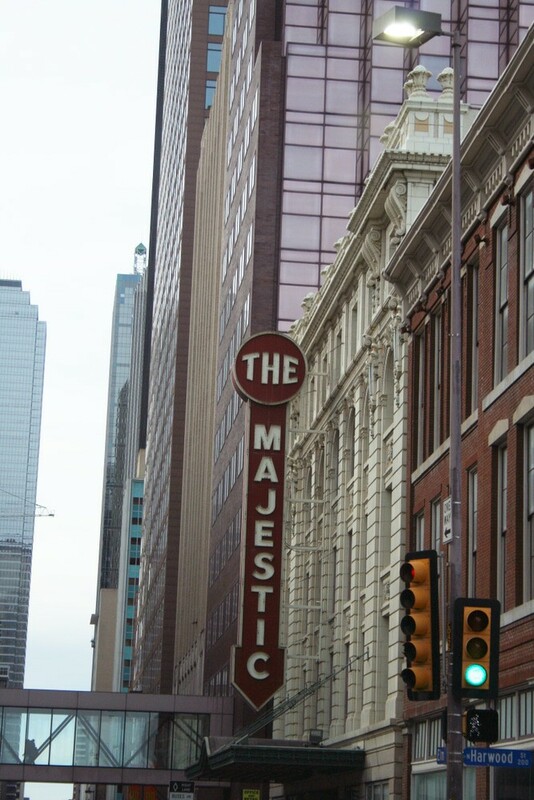 The Majestic is a historic theater on Elm Street in Downtown Dallas which was built during the 1920’s for presenting vaudeville shows and then converted to a cinema house in the early 1930’s. Now the grandiose Majestic is the only remaining theater on what was once Dallas’s version of Broadway, Theater Row. The elaborately facaded building has a seating capacity of one thousand seven hundred and hosts a variety of shows ranging from comedy stand-up to lyrical plays, solo music artists and films. The Majestic is one of the best places to catch a live show in Downtown Dallas. Downtown Dallas’s history goes back to the pioneering days when cowboys roamed the ranges rounding up cattle and cooking pork n beans on an open fire. That fact is still apparent in the apparel on offer in DT today. 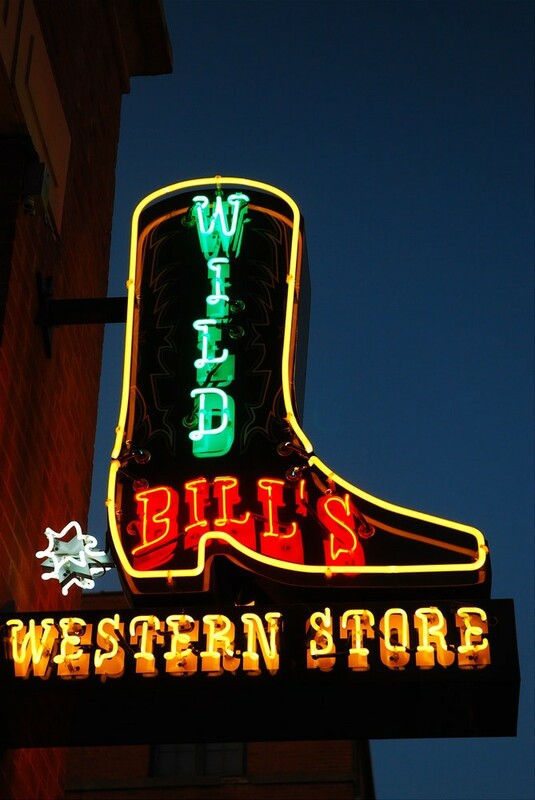 Visit Wild Bill’s Western Store on North Market Street, open for over forty years, and get kitted out just how any fashion conscience cowpoke would. Plaid shirt, engraved leather boots, tight jeans, and that indispensable headwear – the Stetson. Just remember you’ve not been to Downtown Dallas if you don’t go home with a JR Ewing-style, ten gallon hat. Have a great time in the Big D.